Semiparametric regression is concerned with the flexible incorporation of non-linear functional relationships in regression analyses. Any application area that benefits from regression analysis can also benefit from semiparametric regression. Assuming only a basic familiarity with ordinary parametric regression, this user-friendly book explains the techniques and benefits of semiparametric regression in a concise and modular fashion. The authors make liberal use of graphics and examples plus case studies taken from environmental, financial, and other applications. They include practical advice on implementation and pointers to relevant software. 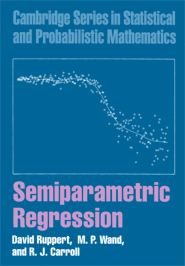 The book is suitable as a textbook for students with little background in regression as well as a reference book for statistically oriented scientists such as biostatisticians, econometricians, quantitative social scientists, epidemiologists, with a good working knowledge of regression and the desire to begin using more flexible semiparametric models. Even experts on semiparametric regression should find something new here.